Laura Mvula's debut is ambitiously confident, as if she and her band had perfected their sound years ago. The very first notes on Laura Mvula's new album feel like a powerful invocation. You're not sure for what, but the moment is awesome — with an emphasis on awe. On paper, Sing to the Moon may seem like yet another album by a young, big-throated British singer, but it sounds like practically nothing else out there. It's not exactly pop or soul or jazz; it's all those things, yet it transcends those things. Over the course of the album, you might be swept into the intimacy of an after-hours speakeasy ("Father, Father"), thrust onto the stage of an old-time cabaret ("Make Me Lovely") or clapping along at a Manchester all-nighter ("Green Garden"). The album's baroque, velvet textures and atmospheric ambiance perfectly complement the lush, smoky curls of Mvula's voice. But even more mesmerizing is the way this former choir director sublimely weaves her band mates' voices with her own, helping to make seven people sound like 70. Perhaps befitting a songwriter in her mid-20s, Mvula mostly probes the complexities of love sought, fought, won and lost. But she wraps these familiar themes with enough mystery and metaphor to make Sing to the Moon feel deeply romantic while avoiding the boilerplate cliches of dime-store romances. Very little on Sing to the Moon sounds like it's overtly designed for commercial appeal; there are no over-the-top diva ballads or fist-pumping club beats. Instead, Mvula and her group produce a debut that's ambitiously distinct and confident, as if they'd perfected their sound years ago but only now decided to share it with everyone else. What begins like an invocation ends up feeling like a revelation. 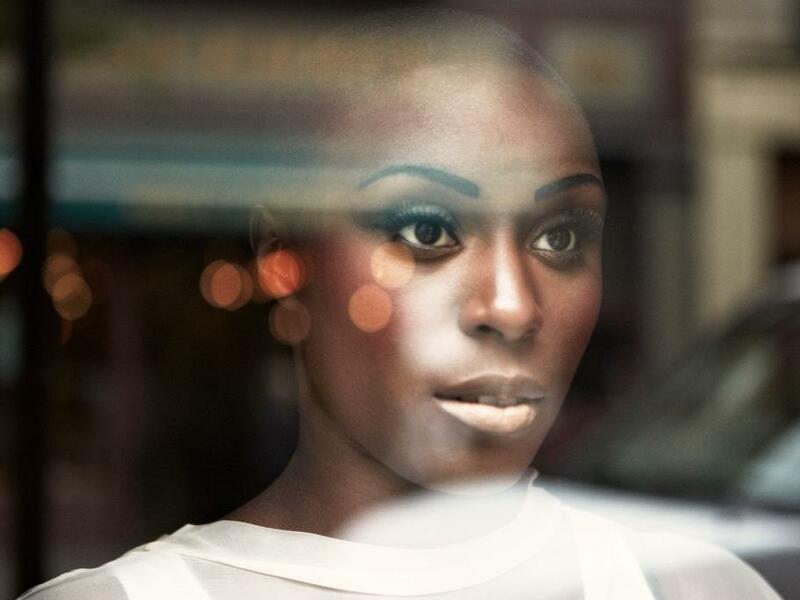 One year ago, Laura Mvula was an aspiring composer working as a receptionist for the Birmingham Symphony Orchestra in England. Now, she has a hit album in that country. One gushing writer even called her the new Adele. Mvula's debut album, "Sing to the Moon," comes out today here in the U.S. and critic Oliver Wang is also gushing about it. OLIVER WANG, BYLINE: The very first notes on Laura Mvula's new album feel like a powerful invocation. You're not sure for what but the moment is awesome, with the emphasis on awe. WANG: On paper, "Sing To the Moon" may seem like yet another album by a young, big-throated British singer but it sounds like practically nothing else out there. It's not exactly pop or soul or jazz. It's all those things, yet transcends those things. Over the course of the album, you might be swept into the intimacy of an after-hours speakeasy. WANG: Find yourself clapping along at a Manchester all-nighter. WANG: Or thrust onto the stage of an old-time cabaret. WANG: The album's baroque, velvet textures and atmospheric ambiance perfectly complement the lush, smoky curls of Mvula's voice. But even more mesmerizing is how this former choir director sublimely weaves her bandmates' voices with her own, helping to make seven people sound like seventy. WANG: Perhaps befitting a songwriter still in her mid-20s, Mvula mostly probes the complexities of love sought, fought, won and lost. But she wraps these familiar themes with enough mystery and metaphor to make "Sing to the Moon" feel deeply romantic while avoiding the boilerplate cliches of dime store romances. WANG: Very little on "Sing to the Moon" sounds like it's overtly designed for commercial appeal. There are no over-the-top diva ballads or fist-pumping club beats. Instead, Mvula and her group produce a debut that's ambitiously distinct and confident, as if they had perfected their sound years ago but only now decided to share it with everyone else. What begins like an invocation ends up feeling like a revelation. BLOCK: We're listening to Laura Mvula from her album "Sing to the Moon." Our reviewer Oliver Wang is a professor of sociology at Cal State Long Beach. He also writes the audio blog Soul Sides. This is NPR News. Transcript provided by NPR, Copyright NPR.